Decorating for the changing seasons is a fun way to spend the afternoon with kids, or heck just for yourself. Fall especially is a fantastic time to use natural elements as free supplies. A nature walk might see beautiful leaves, acorns, or small twigs become a wonderful decoration and keepsake. Unfortunately, autumn weather might also mean colder temperatures and rain (or even snow!) Here are a few fun and simple Hallowe'en craft ideas for what you might already have on hand. The first clever craft courtesy of the Maven of Style herself (Ms. Stewart for those not yet addicted) is sure to be a crowd pleaser. 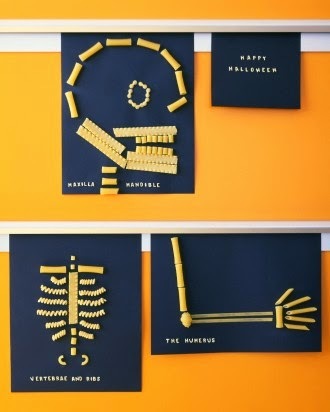 Macaroni art is a classic activity for kids that I remember so fondly myself and this spooky twist is fantastic. Start with black construction paper, pasta and a quality glue. You will likely need a liquid such as Elmers for good sticking power. A glue stick might not cut it longterm. Once you have the tools, build a creepy masterpiece in no time. If anatomy is not your thing, why not a black cat, bats or tombstone shape? This would work well with any shape of pasta you have on hand and especially if you had a couple of boxes with just a little left over. You could substitute cotton balls or marshmallows for a haunting look. Or try painting heavy cardboard black for a hang-able creation. 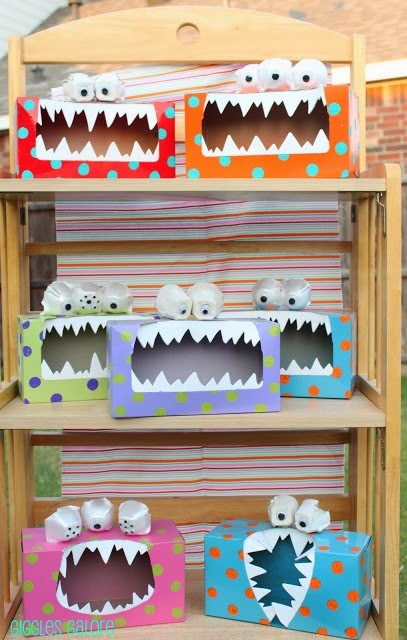 For something a little less scary and more colourful, why not try your hand at one of these adorable tissue box creations. Giggles Galore calls them "Tattle Monsters" and boy are they cute! Intended as a teaching tool, they make a fun anytime craft for kids of all ages. You need a tissue box of any brand, an egg carton and the decorations of your choice! The pictured crew includes some craft paper, googly eyes and some white paper for the pearly whites. You could also add pipe cleaners for arms and antennas or fur and felt pieces for a great texture. This is a great way to stray from the standard orange, black and white that prevails at Hallowe'en and let your imagination run wild. You could recreate characters from your favourite movie with greens, teals and purples. You could use your school colours, or match them to your child's bedroom. Anything goes. If your kids are younger, a fun way to craft and be messy without lots of small pieces is the good old fashioned potato stamp. A staple of the fall pantry, potatoes can be carved in to a number of ghoulish shapes for artwork, costumes and more. To duplicate the picture you will need a few medium sized potatoes (cut in half for carving), craft paint and paper lunch sacks. 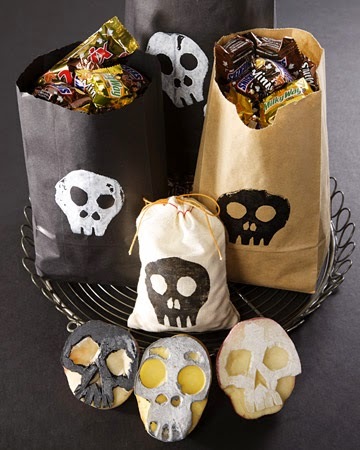 Martha suggests this funky skull design for class room treat bags, but you don't need to stop there. How about pumpkins for a seasonal centerpiece, or witch hats for a fun garland? Carvings can be anything your mind can imagine and it will become an activity you will want to do again and again. Don't forget, whatever you carve will be backwards when you stamp! If you're spelling something, try writing it out on paper first and taking it to the mirror to ensure the best results! 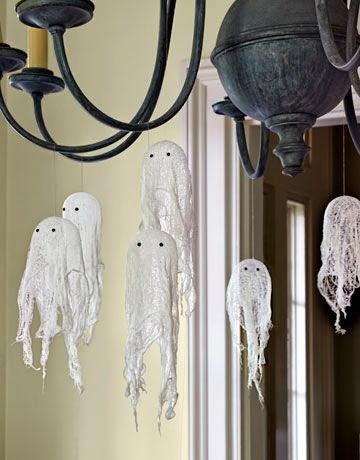 Ghosts are an easy craft to be made with just about anything you have in the house. Try balling up some paper towel and wrap with tissue paper for classroom friendly scare. Use a pom pom wrapped in facial tissue and tear the edges. Or take it up a notch as Country Living as done here; small paper cups and white balloons draped with cheesecloth for a more antique look. You can do as little or as much as you like. Add arms, fearful expressions or keep them simple, it's really up to you. Great to group outside in a mobile or hang throughout your Hallowe'en party, all you really need are 3 basic components; something solid, something gauzy and a black marker. Share your favourite Hallowe'en craft or show us how your little Picasso recreated one of our suggestions above! Message us on Facebook at www.facebook.com/WIYDB or comment below!